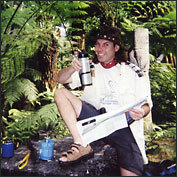 Your language adventure guide comes from New Zealand where he spent some of his youth hiking through the native bush and meeting eco-refugees from throughout the world seeking to escape from the places I badly wanted to go to. To learn more I joined the Institute of International Affairs, got a Masters in Politics and a Diploma in Journalism, just to be sure, then I headed abroad. First came a few years living and working in London and Scotland, more in the spirit of Orwell in Down and Out in London and Paris than Fitzgerald's Great Gatsby. Then, on discovering that the rest of the world did not speak English, I became an English teacher and sought to convert them. This took me, teaching certificate in hand, through Poland(99), Slovenia(00), Slovakia(01) and Germany(01), teaching general and business English and doing a very brief and unsuccesfull stint of broadcasting for Radio Slovakia International. To mitigate professional disappointment I tried my hand at skiing, kayaking, mountaineering, bike touring and even, having lost some missionary zeal, learning some foreign languages. Now based in Bologna, I lead a family life while looking wistfully at old photos and doing a spot of teaching, translating and learning the local history with Monte Sole Bike Group.